1. Running on the treadmill has made me actually start hating some of my favorite songs. There’s something torturous about running in place for forty minutes, and after a while, my favorite singers seem to be mocking me. 2. It’s been raining basically every day, and if it’s not raining, then it’s ridiculously scorching hot. Like, I step outside and feel my arm hairs burning off, it’s that hot. 3. So I heard running early in the morning is a thing. But so is sleeping in as late as possible during the summer. So I do a kind of combination, where I wake up early, then lay in bed for an hour, patting myself on the back for waking up early, but too lazy to get up actively choosing to just lay there. 4. I have to walk through the kitchen to get outside, and then I see my Kitchen Aid, and then I get…distracted. For example, I’m heading out for a run, and two hours later, I end up with a lemon yogurt cake, or a strawberry almond cream tart. Oh sweet, delicious calories. So before you write me off as a lazy indulgent wimp, I promise you, I do go running. I have, against all odds, made it to three miles of varied terrain, which I’d say is pretty good for someone who hasn’t exercised seriously for at least seven years. I recently read it’s not about distance covered, but rather about time spent exercising, so I’ve worked up to about an hour of constant motion. But I’m not above a little reward for my efforts. 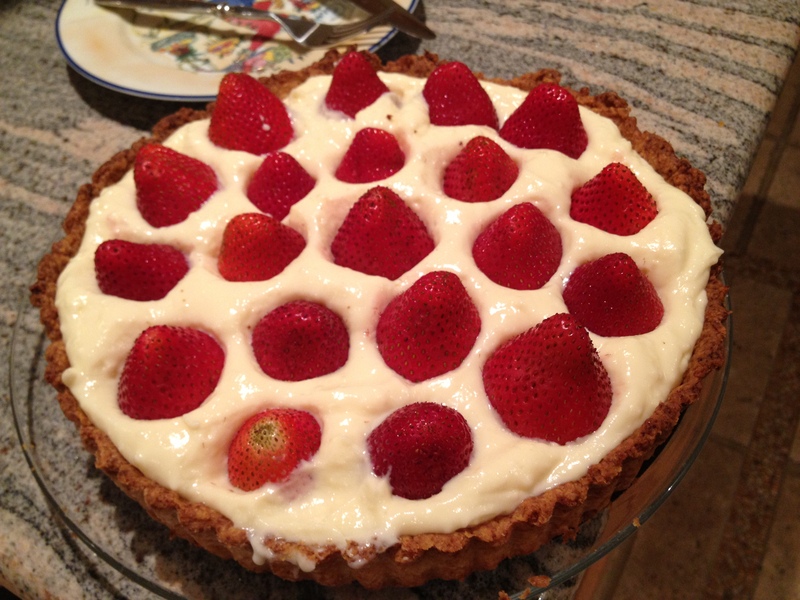 Enter the strawberry almond cream tart, the perfect dessert after a sweaty jog under the hot sun. Sweet, unadorned berries atop cool, creamy pastry cream, encased in an almond crust. So let’s be real. The goal of my summer was basically to exercise more so I could eat more. Mission (partially) accomplished.